AllyNova Tree Menu - Create a tree menu for your websites. Usually, your websites may have many web pages, and you build many text or image links for your visitors to find these pages, but most of visitors aren't patient enough to find these pages. So we need to build a tree menu to navigate your websites. The publish wizard enables you to insert tree menu to web pages automatically. The generated tree menu is OS and web browser independent. 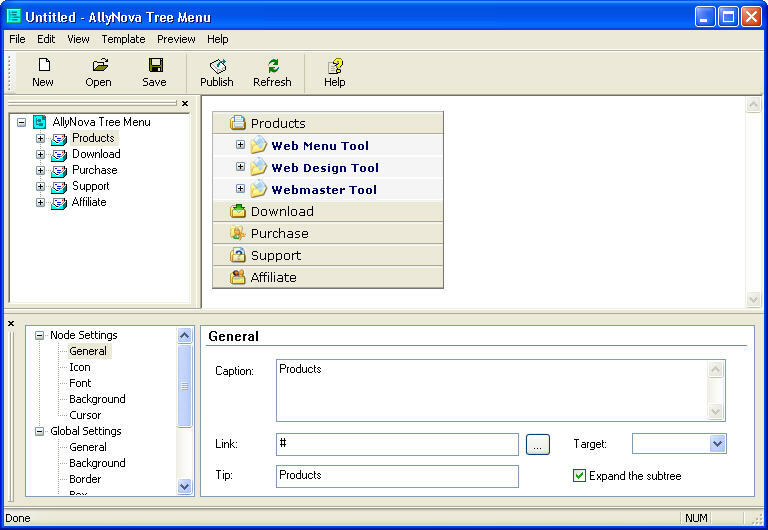 The generated tree menu can be inserted to almost all types of web page files. AllyNova Tree Menu program is a powerful and easy to use Tree Menu Maker which enables you to build various attractive and functional tree menus for your website. 10-Strike LANState - It is a network mapping, monitoring, management, and administration software solution for corporate Microsoft Windows networks. AGUTA PAD submitter - A tool for automatic registration of PAD files in shareware catalogues, with multithreaded execution providing high speed of form submission. FFA Blaster - Create your own advertisements and blast them out to millions of FFA links pages using 28 ports simultaneous all over the Internet. Fast Link Checker - Go through all pages to find broken links on web sites and give you a detail report about all found broken links.It supports HTTP, HTTPS and SOCKS proxy servers.